Hello! Welcome to the Pat Bravo Minis Blog Tour! 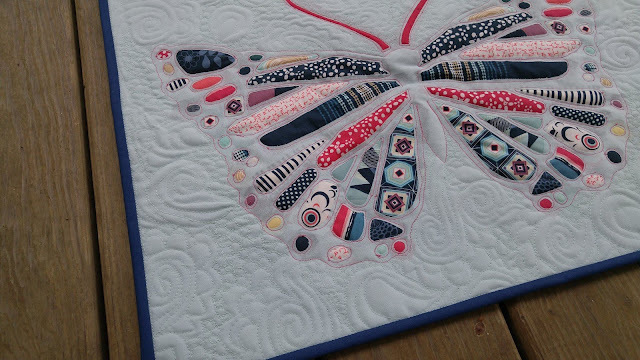 I'm so excited to be one of thirty makers chosen to create a mini quilt for this blog hop! 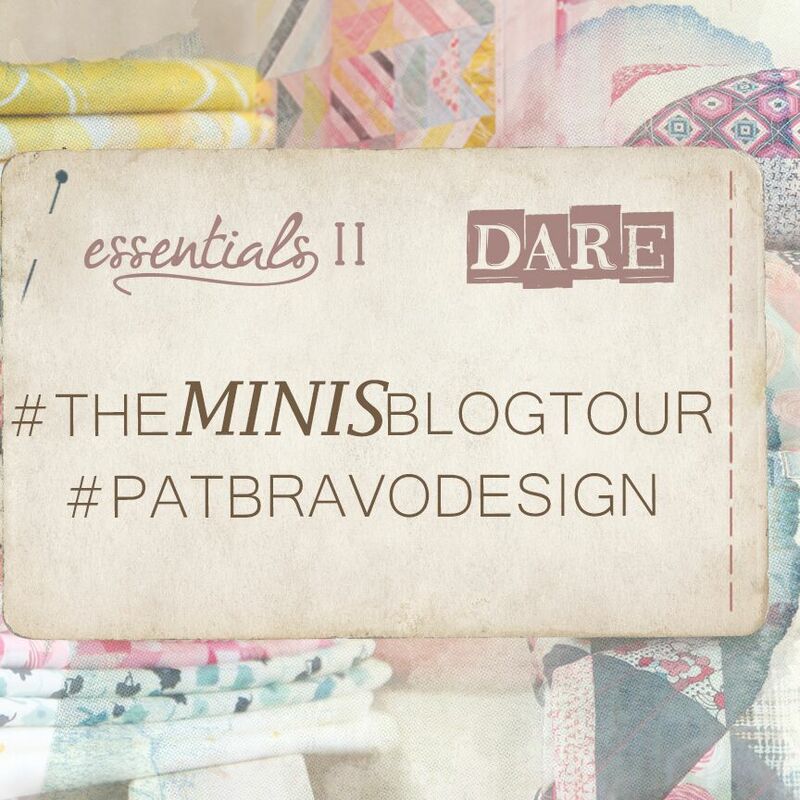 The fabrics are a combination of Dare Fabrics and Essentials II Fabrics designed by Pat Bravo for Art Gallery Fabrics. Pat's Dare fabrics come in two colorways: Dare to Be Bold and Dare to Be Funky (I'm using the latter). From the Essentials II line, I'm using several of the fabrics from the Azur colorway. You can read more about the blog tour on Pat's blog here. If you're new to my blog, I always share the story behind each quilt that I make and give you a look behind the seams. 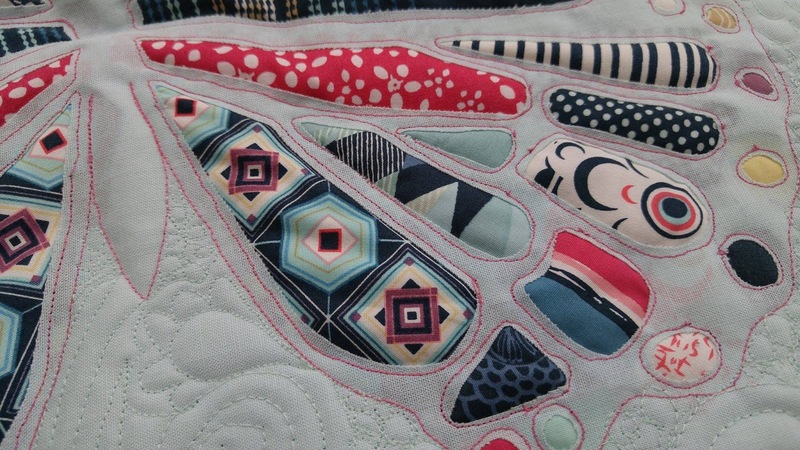 I hope you'll snoop around and check out the other quilts that I've made too! I have several patterns that will be released this summer, so be sure to subscribe to my blog or find me on Instagram or Facebook so you'll be the first to know when they're ready! As soon as I found out I'd be participating in this blog hop, I knew exactly what I wanted to make! I started with a clipart image of a butterfly. I enlarged the image to be roughly 18 inches wide. Once printed, I taped the pages together and cut out the spaces where I wanted to put fabric to create a template. I chose a light turquoise color for the background of my mini. 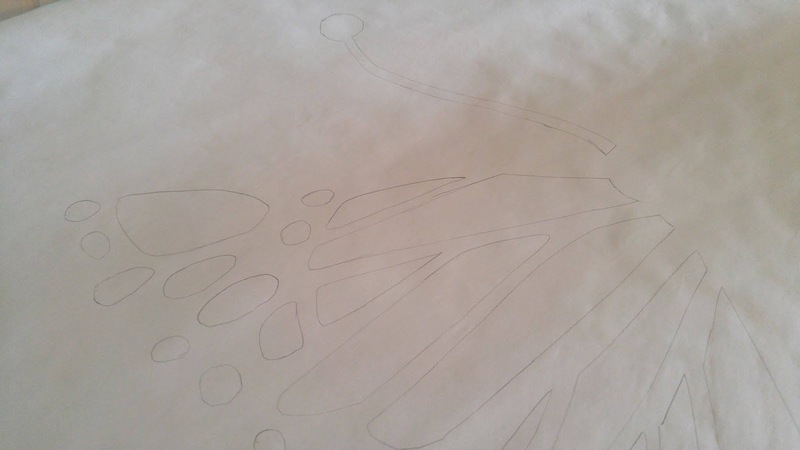 I ironed Heat-N-Bond to the back of a piece larger than the butterfly template. 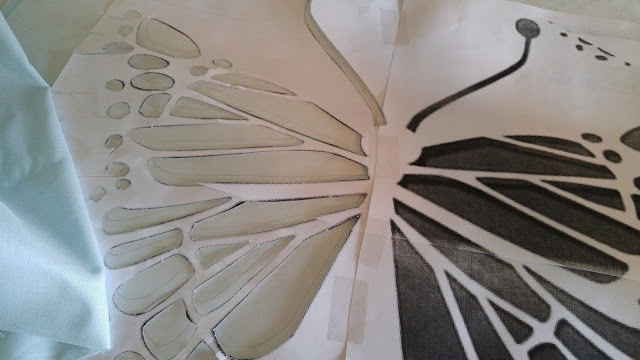 Then using the paper template, I traced the butterfly image onto the Heat-N-Bond paper now on the back of the fabric and cut out the spaces. Once each section was cut out, I removed the paper backing. 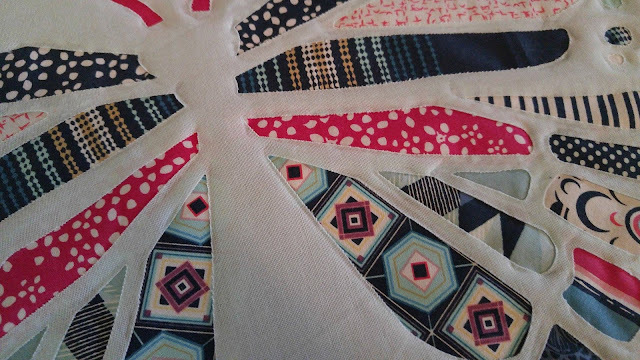 The hardest part of making the mini was choosing which fabrics to go in each spot! 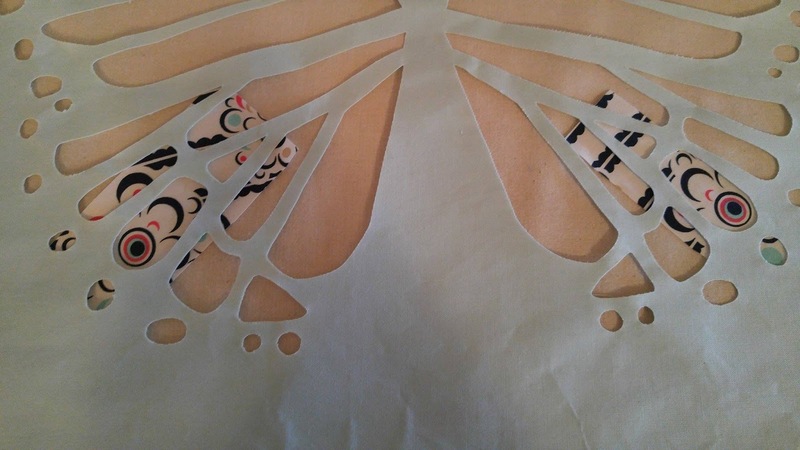 I fussy cut the fabrics to make the butterfly wings as symmetrical as possible, but decided on a random layout within each wing. Once trimmed to the size needed, I lightly touched the iron to the section to hold it in place before moving to the next fabric. I started with a pink thread and outlined each section in the wings. Then I quilted around the entire butterfly to really define the shape. I switched to a light aqua thread to quilt the background. 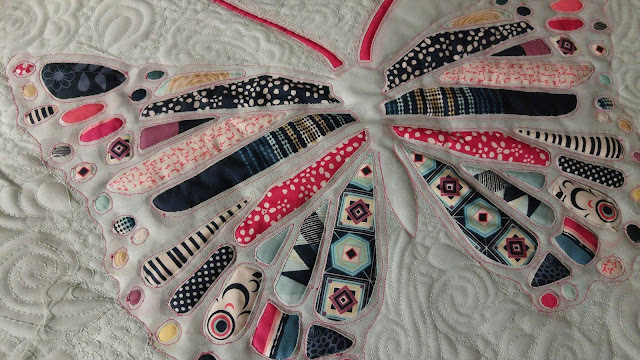 I quilted swirls and pebbles in the rest of the space around the butterfly. 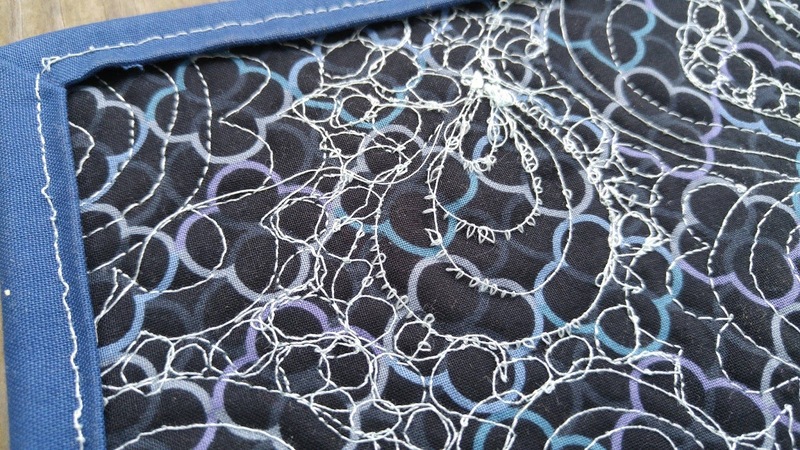 For binding, I used a dark blue RJR solid from my stash. The finished quilt measures 16" x 20". I really love the overall result! AND, this is my 16th quilt finish for the year! I've hit my 16 quits in 2016 goal - in April! But let's be real. I always try new things with every quilt I make and that leads to always learning new things. First, I used a heavy duty Heat-N-Bond because that's what I already had on hand. But that caused major issues when quilting on my Bernina Record 930. The sticky residue gummed up my needle and bobbin hook, which then caused tension issues and thread breakage. Often. It's not noticeable from the front, but the back is pretty bad. I chose to leave these imperfections. It's not for a museum. It's for real life. Second, many of the fabric pieces in the butterfly are significantly darker than the light aqua fabric I used for the top. 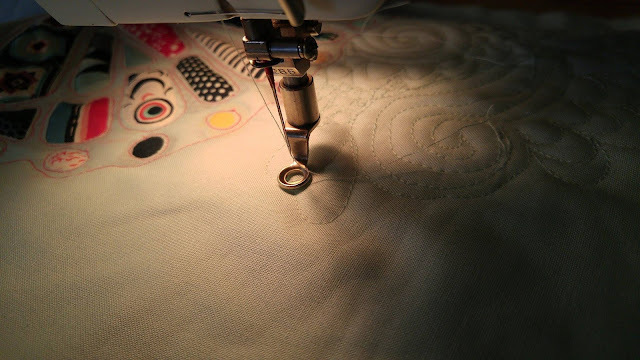 Consequently, there is a fabric "shadow" behind several parts of the quilt that can still be seen after quilting. Do these imperfections ruin the quilt? Absolutely not! They are proof that it is handmade. Twenty quilts from now, I'll look back and know exactly where in my quilting journey I learned these lessons. I won't beat myself up over it. No time for that - I have more quilts to make! 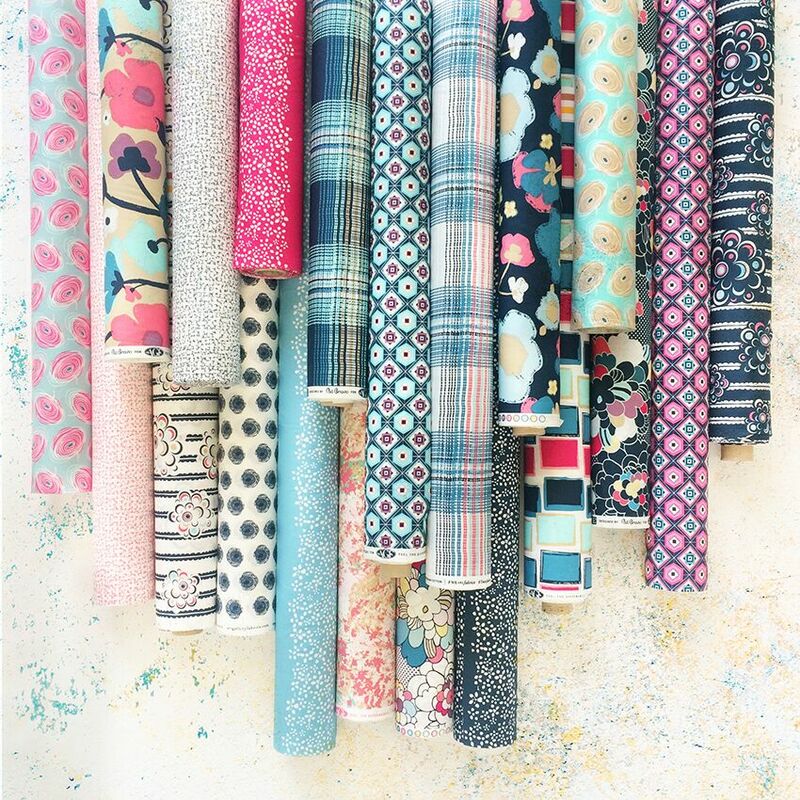 I love to use up even the tiniest of scraps, and I didn't want any of these fabrics to go unused! So here's how I used my fabrics to the fullest! I started with 15 Fat Sixteenths of fabric. These each measured 9" x 10". From this, I cut all the pieces for my Dare to Fly mini quilt. 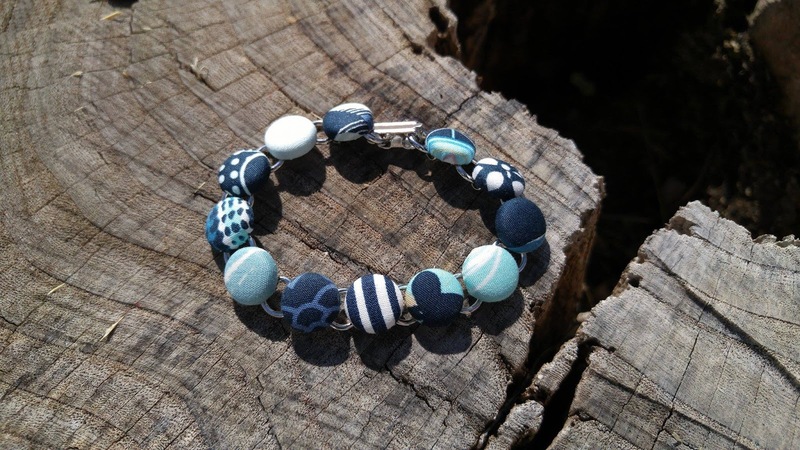 Then I used my favorite prints to make a covered button bracelet! 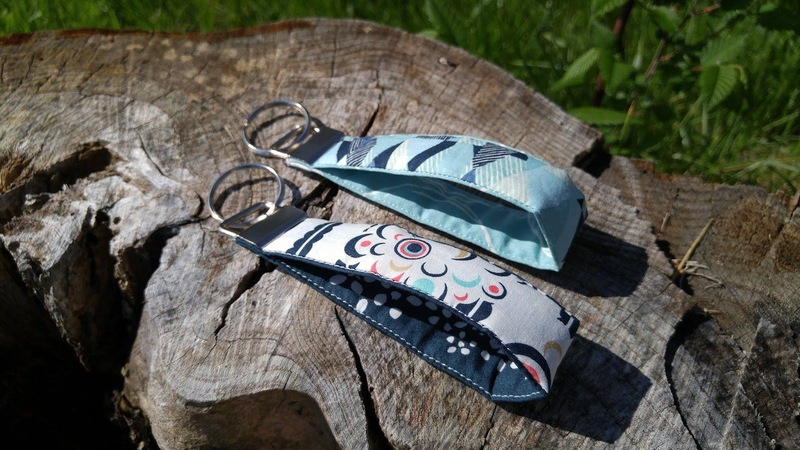 I chose a few coordinating prints to make key chains too. All of these projects led to some pretty odd shaped scraps! 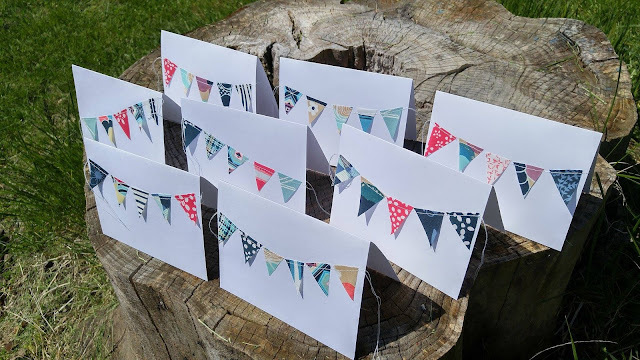 So I used those to make some bunting notecards. I love sending a matching card when I gift a quilt! 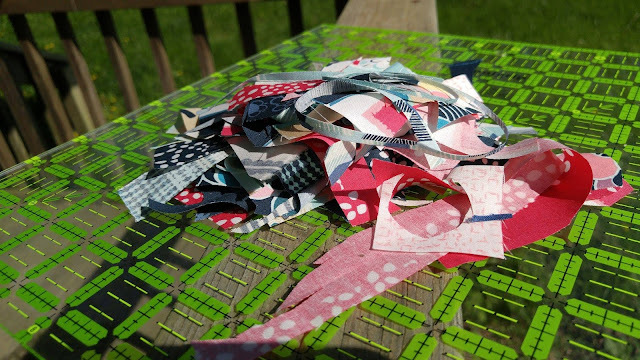 Even after all those projects, I still have a big pile of scraps left! All from just fifteen 9" x 10" pieces! I do hope you'll follow along each day to see the other 29 mini quilts! There are two makers each day until May 16th. Here's the lineup for the entire Blog Hop! I can't wait to see the minis these amazing makers come up with! 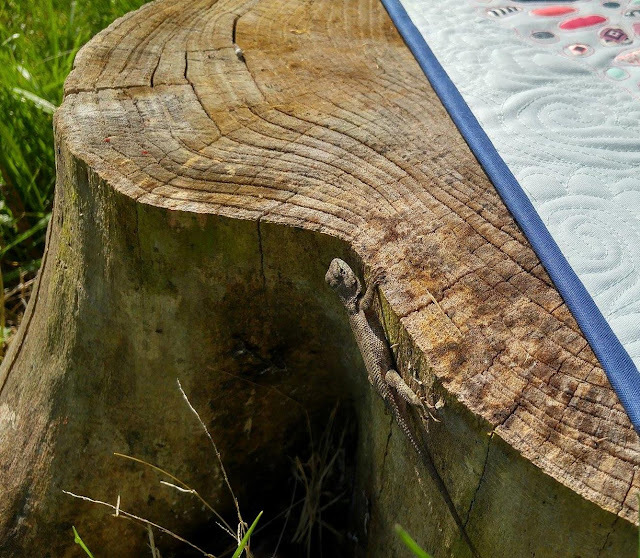 Want to know more about the fabrics used? Check out the lookbooks for Dare Fabrics and Essential II Fabrics. Visit Pat Bravo's website for info on them too: here and here. You can also connect with Pat on her blog, Instagram, Facebook, Pinterest, and Twitter pages. There are actually THREE giveaways, so there will be THREE winners! 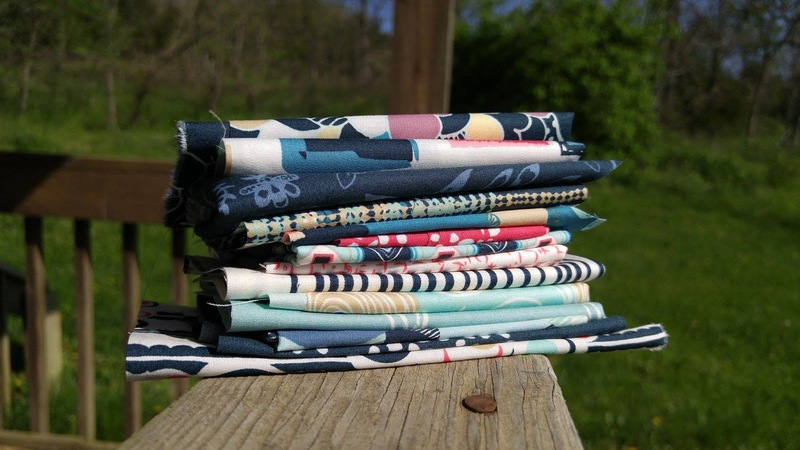 One person who comments on this post will win 15 Fat Sixteenths of the fabrics I used in my mini! 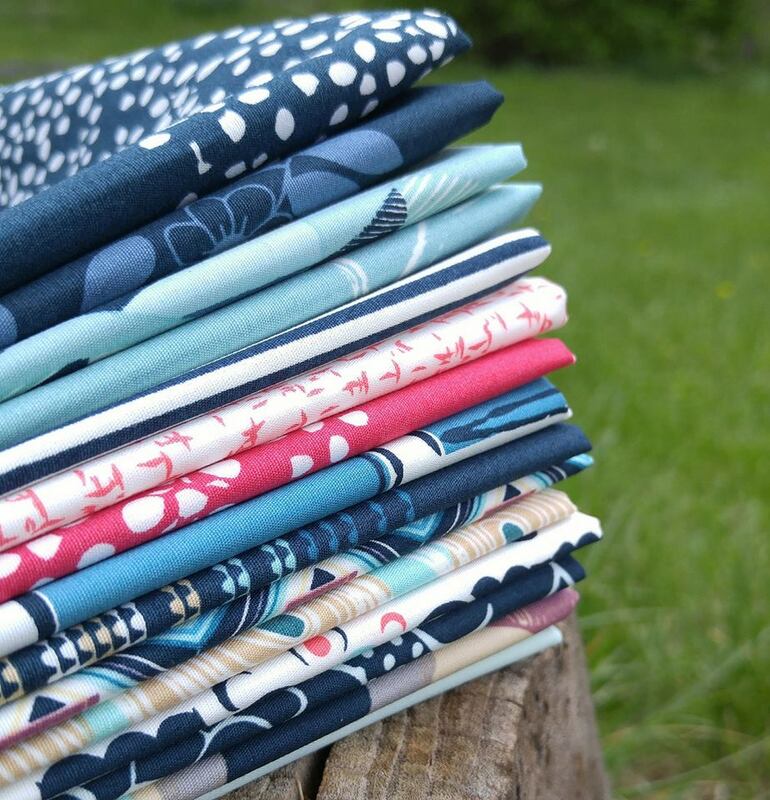 A beautiful combination of Essential Elements II and Dare Fabrics by Pat Bravo! Just comment below with your favorite way to use up the tiniest bits of scraps. There's a second giveaway for the covered button bracelet over on my Instagram account! AND a third giveaway on my Facebook page for the key chains! I love the mini and your creative ideas for using up all the scraps. Thanks for sharing the lessons you learned too! I give my tiny strips to my mom and she uses them on small note cards that I enclose with each order I send out! Thank you! Looking forward to seeing your mini too! Thank you! Can't wait to see what you make too! I love reading your process. Beautiful mini! Thank you! Looking forward to seeing your mini quilt too! Thank you! I'm really looking forward to seeing what you came up with! I save the scraps for future mini quilt projects! Your butterfly is very pretty! Thank you! I think I could make a couple more mini quilts with what I have left! Your butterfly is beautiful, and the method you used to make it is so interesting. Thanks for the tutorial! I use my super tiny scraps for stuffing small children toys. For the really young ones, you don't want to use polyester. 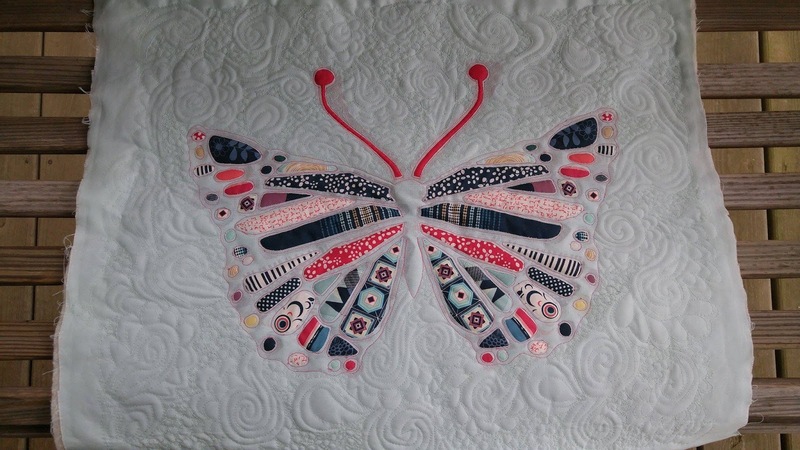 I enjoyed reading how your created your butterfly quilt, it's beautiful. 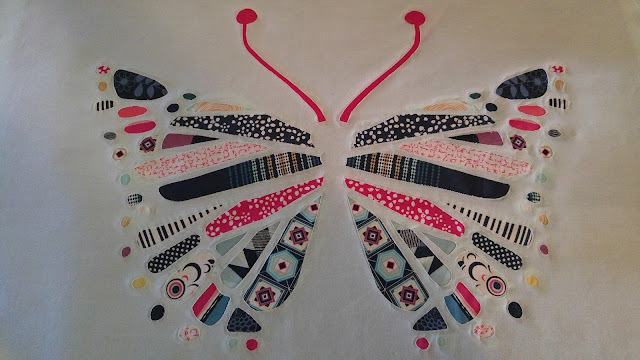 I save all my scraps and use them in applique projects. For my birthday I received a copy of Terrie Sandelin's book Miniatures in Minutes, can't wait to get started on one of her projects. Thank you! I'll look up that book! I love quick projects! I love the mini- and thank you for such a detailed photos so maybe I can recreate something similar in my little girl's room! I also really appreciate your attitude towards the imperfections- I think we all need the reminder that we don't need to be too hard on ourselves! I'm still figuring out how to use the tiny scraps I save, but I did use some in a few Valentine's minis this year. I'd love to see what you make! Thank you for stopping by! I love the butterfly mini. 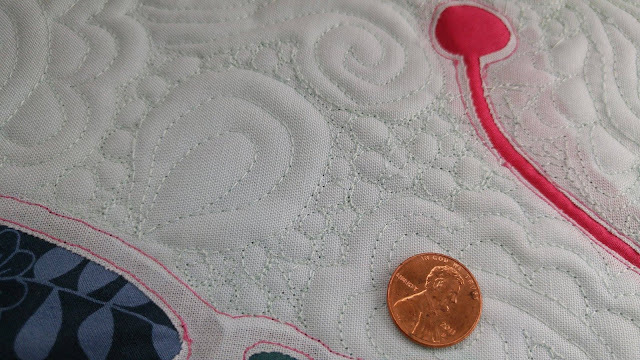 I use my tiniest scraps for an applique quilt. Thank you for the inspiration. You have some lovely projects. Thank you! The fabrics were wonderful to work with! The butterfly is awesome! I use some tine scraps for paper piecing. Thank you! 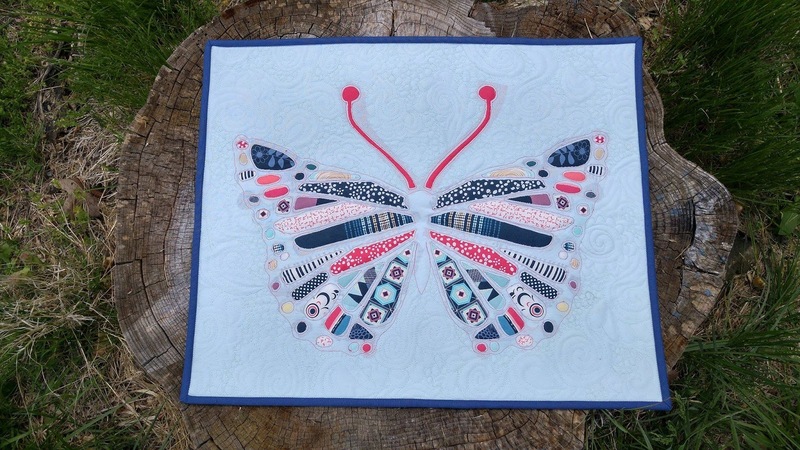 I love paper pieced projects too! I love your Butterfly Quilt. Usually I Mod Podge something with tiny pieces or they go in my stamp collection. Thank you! A mod podge project sounds interesting! I will have to search Pinterest for some ideas! 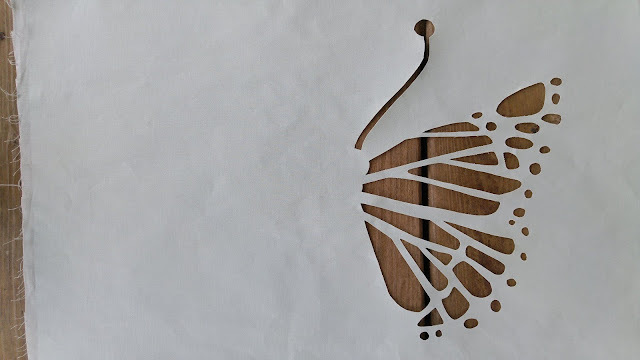 Your butterfly mini is so creative. I love it! I also try to use up all my scraps ,even the tiniest. I like to paper piece so I can use some of the smaller pieces. Thank you for sharing! Thank you! I love to paper piece too! Thank you! I'm glad we can connect through Facebook! Laura, thank you for sharing your Butterfly mini quilt . Dare to be Funky it is..beautiful too. I love the lizard shot sneaking upon your creation:) THank you so much for your tips on fusing and the choices. I'm new to applique and using Heat Bond, etc. Your work is so intricate and gorgeous. Mini scraps get turned into greeting cards just like yours. I've been stitching my tiniest of scraps like the 1" ones into 3" -4" rows and making coffee cup sleeves. Great way to use up my batting scraps too. Thank you! Coffee cup sleeves is a great idea! I made a name tag for my MQG meetings with my scraps most recently. BTW I love your attitude towards learning through the process! Thank you! 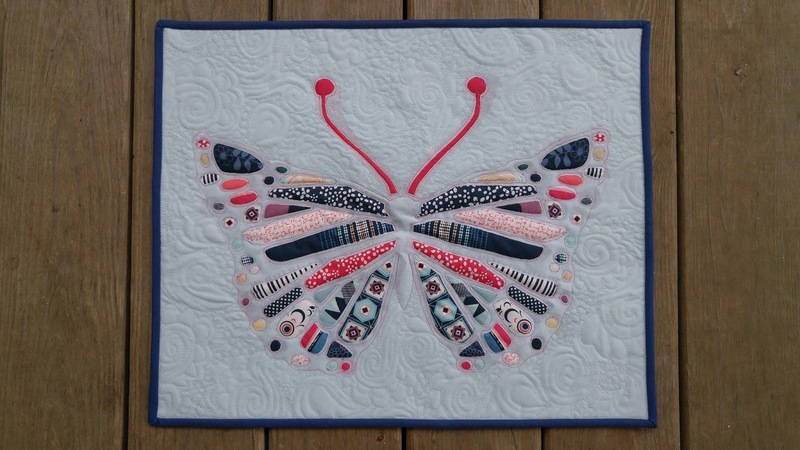 I must like butterflies too - this is my second butterfly quilt! I love using up scraps. 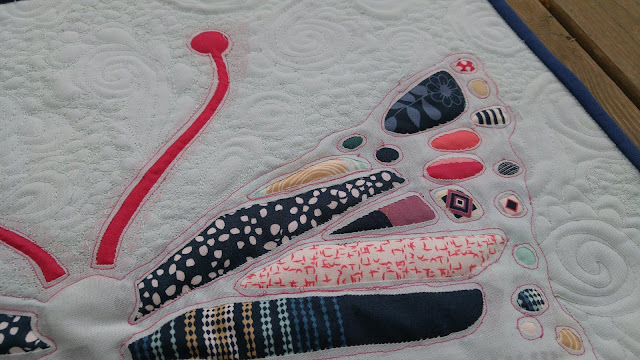 In fact, one of the things that I find both fun and challenging is to beg the scraps that a quilty friend is planning to throw away and to use them to piece something. Anything. It is great fun, I love working small, and I love the challenge of working with someone else's fabric challenge. I once started a mini (with my own scraps) based on squares in the Fibonaci sequence and making a fibonaci spiral representing spring flowers. I started with snowdrops in the first 1 inch square, squill in the second 1 inch square, and so forth. I quit after making the 2 inch, 3 inch, and 5 inch squares as the squares were growing too large to manage the same scale as the earlier squares. Unfortunately that piece was lost on one of my retreats. Thinking about it now is leading to a determination to remake a mini quilt to replace it. Thank you for explaining your reverse applique process. Personally, I think the light fabric shadowing you mention isn't very obvious, and I think it helps to represent the rest of the butterfly -- the background to the colorful markings. I also like the idea of scraps on cards and have the blanks to make my own Christmas cards this year. Wow! A Fibonacci quilt sounds amazing! I love mathy things! If you remake it, please share! Will do. Love mathematical things myself. Give me a straight edge and graph paper . . . . I'll stay busy for hours. Loved the look into your process, and I especially appreciate the lessons learned bit. I agree that handmade does not equal perfection, and really, it never should! 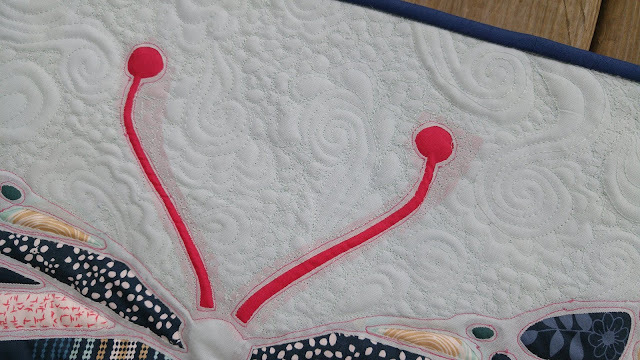 You get beautiful results - like your butterfly quilt - even with the few snags that you ran into. For small scraps, I like to sew them together to make bigger pieces, in essence making my own fabric! Thank you! I love the idea of making "fabric" with my scraps! Gorgeous butterfly! I use lots of scraps in my The Splendid Sampler qal histed by pat Sloan and Jane Davidson. 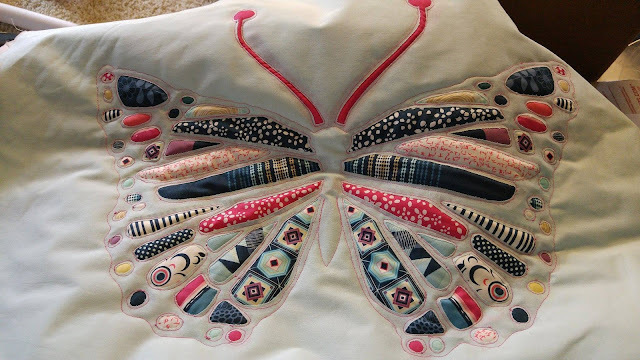 I love the butterfly and would like to make one. If you do make one, I'd love to see! That is a great scrap idea! That butterfly is gorgeous! I also love that you showed your imperfections. I think so many people are afraid to show stuff like that. I like to use small scraps in mini minis. Thanks for the chance to win! Thank you! Mini minis are a great idea! I love your butterfly! Thank you for sharing. I don't use the tiny scraps, but I do try to cut my scraps into squares to use in future projects. Thank you for the giveaway. Thank you! 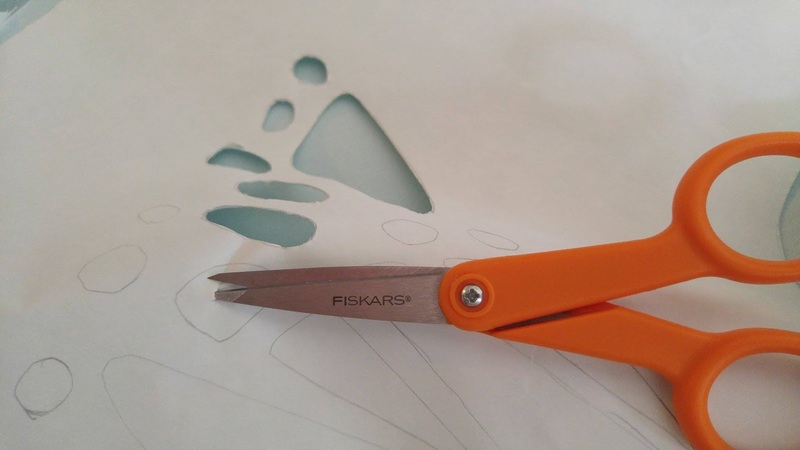 Cutting the scraps into usable pieces before putting them away sounds brilliant! 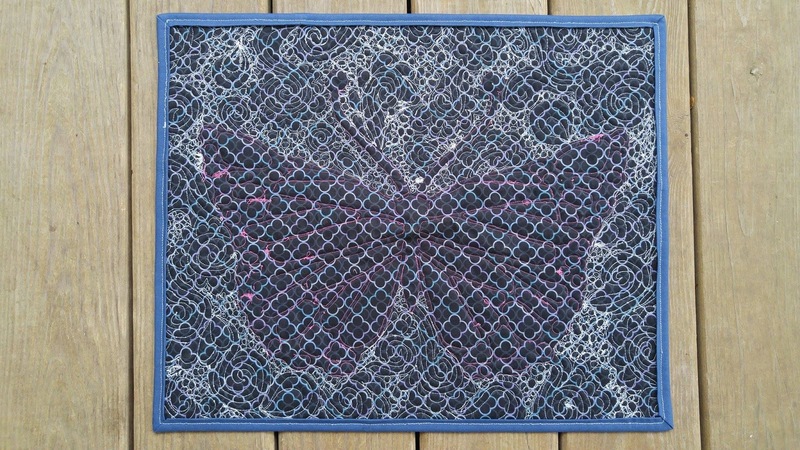 Your butterfly is gorgeous and the tutorial was great - thank you. 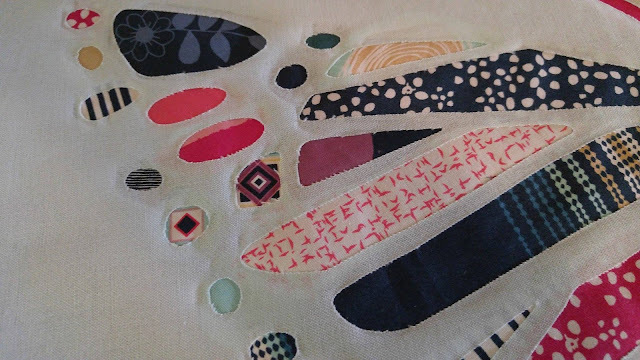 I use scraps in applique. Love your butterfly tutorial!!!!!! I take my tiny scraps and make a "ticker tape" style mini wall hanging with them. Looks like fabric confetti sometimes! Thank you! 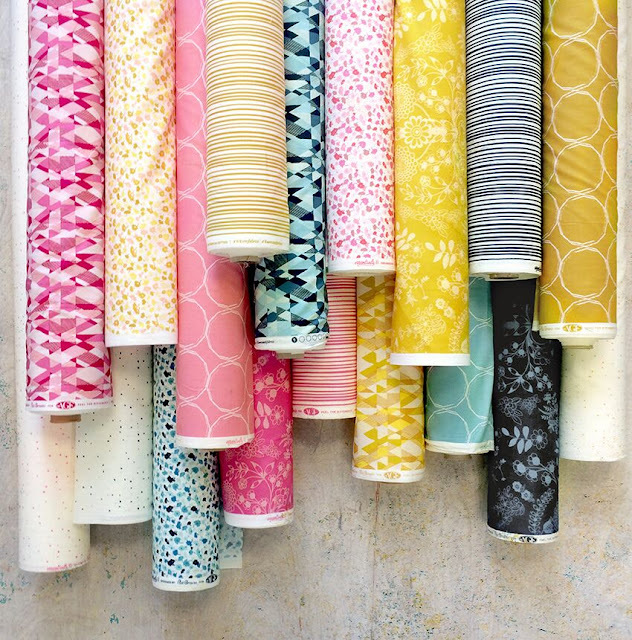 I haven't made a ticker tape quilt yet, but that's a great idea! Using the tiny scraps for eye candy is a great idea! Wow, what a creative way to use the fabric. I use my minis and scraps by making small table toppers. I like to change them with the seasons. Great projects! I'm guilty of this too! Hoping to come across a fabulous idea one day! Wow, what a brilliant butterfly quilt, I must try that technique but maybe something smaller to suit my skills lol But I also rally like the way you used the scraps left over and I would never have thought of making the bracelet like that. That's inspired! I use my scraps to make minis---love them. I love that they are a quick finish too! 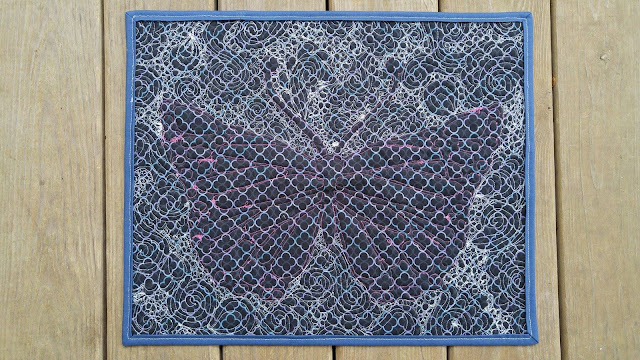 I love this color combination, as well as your butterfly pattern. I would so love to win these! I stuck with you through the end because your writing is interesting! I love hearing about other's creative processes, and yours are wonderful. Especially wonderful in how you choose to deal with imperfections. I wish I could let go of my own penchant for perfection. It sure makes enjoying projects hard and tiresome! Your butterfly is beautiful, and I did not notice any imperfections. Thank you for sharing all your process with us. Thank you! My boys love to play with my fabric too! love this:-} i too do not stress about how it comes out, like you say hopefully we learn from our booboo's . scraps are used also, firstly a cushion or pillowslip, if theres enough. then its down to cutting it up into usable pieces or squared up and put back into pile. Thank you! Cutting up the scraps before putting them away is a great idea! ha, you're talking to another queen of tiny scraps. 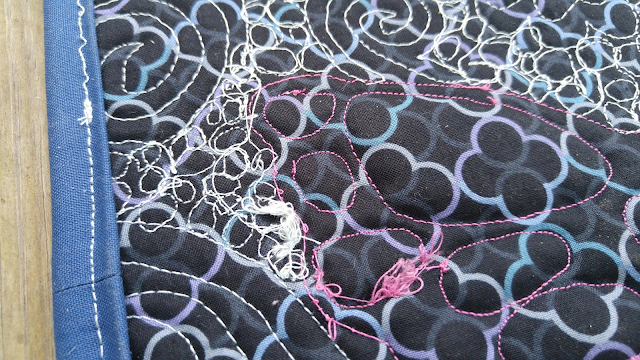 I guess I love piecing them together to make new fabric full of pattern and line. Next favorite is paper piecing tiny patterns. I next to never throw away a scrap! They are so rich! Thank you! Making a "new" fabric is a great idea! Your mini is just beautiful. I am glad you showed how you made it as I was trying to figure out how all those little pieces would work. Still, quite a lot of work. But worth it. I found myself shaking my head as I read this post and wondered how come I never thought of making something like this! I know...I'm not as creative as you! 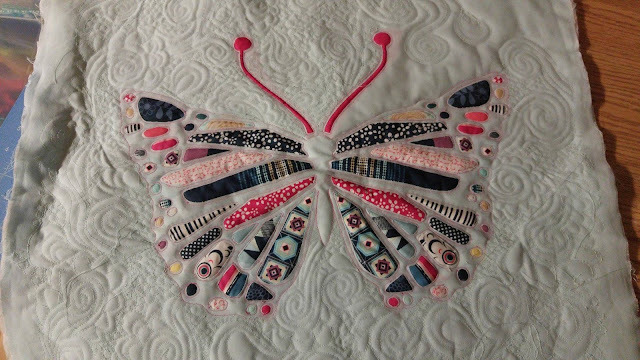 The butterfly quilt is amazing and thank you for sharing your photos and details so some of us can try to make something similar! Ooops, I forgot to tell you how I use up my teeniest bits of fabric! I like to use them to make greeting cards. I sew bits and pieces together and make flowers, birds, houses, etc. and each one is unique! I use tiny scraps to decorate cards and letters! Love sewing on paper. I haven't sewn on paper very much - but it seems like a great way to use up the very tiny pieces! Wow, I love your mini quilt!!! 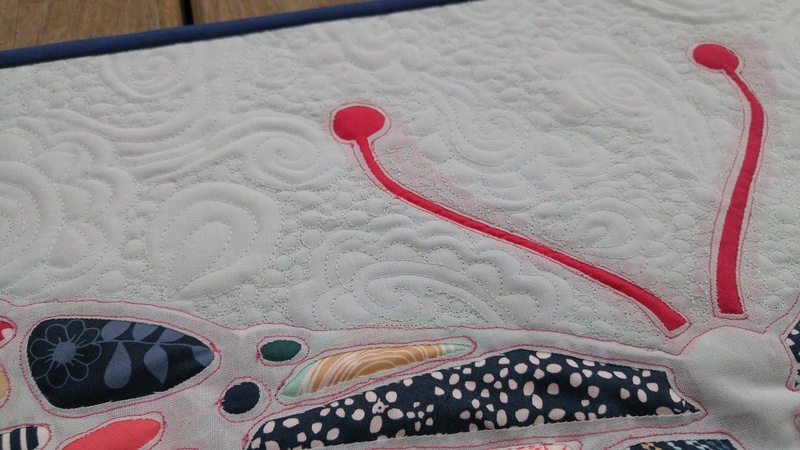 I like to dabble in quilting but I'm not near as good as you!! 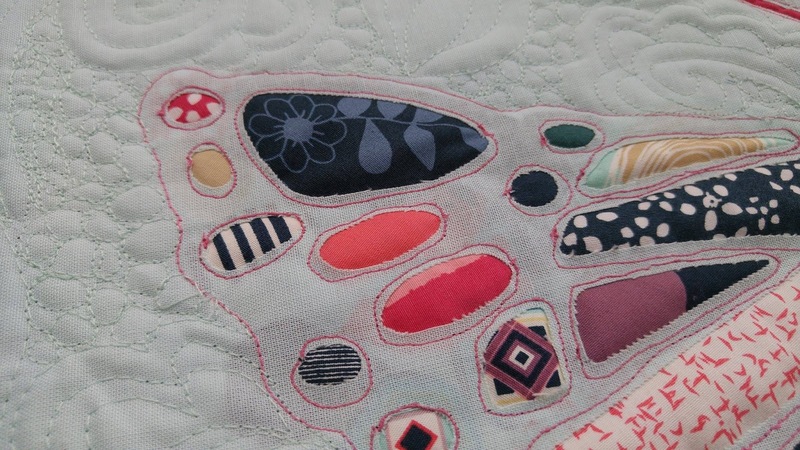 I've got a small stash of scraps and a mini quilt seems like a fun idea so I will be trying it out! Thank you! I didn't know you made quilts! Quilting keeps me sane when staying at home with my boys! Your butterfly is absolutely delightful! What a great way to use scraps! They were wonderful to work with too!